Ethanol can be fermented from many sources of starch, including corn, wheat, grain sorghum, barley, and potatoes, and from sugar crops such as sugar cane and sweet sorghum. 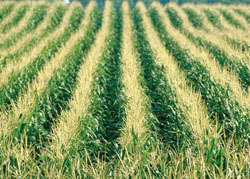 Because there has been has been an abundant supply of corn, most of the ethanol made in the United States is from corn. Most of the ethanol is produced in the Midwest and Upper Midwest where ethanol plants are close to and have a consistent supply of corn, access to water resources, and have livestock production nearby. A by-product of ethanol production is distillers grains, which can be fed to livestock either wet or dried. Because the wet distillers grains are perishable and heavy, which adds to transportation costs, they are usually used within a 100 mile radius of an ethanol plant. Distillers grains are more stable and easier to transport when an ethanol producer dries them, however that increases the energy cost for the ethanol producer. Distillers grains retain many of the nutrients from corn, since only the starch has been removed. Due to the high fiber content most of the distillers grains are fed to beef and dairy cattle, however, they can also be used as poultry and pig feed. In most of the newer ethanol plants, also known as "dry grind" plants, the corn kernels are finely ground into small particles. Then water is added to the ground corn along with enzymes to convert the starch for fermentation. The mixture, also known as mash, is cooked to break the starch down further. The mash is removed from the cookers and allowed to cool before a second enzyme (glucoamalyse) is added to the mash. This enzyme helps turn the liquid starch into sugars. Yeast is added to the mash and the fermentation creates ethanol and carbon dioxide. After about two days, the fermentation process is complete and the mash is heated again. During the heating process, the ethanol evaporates into a vapor that is collected, while the remaining corn and yeast solids remain. The ethanol vapor is cooled and condenses into a liquid. This liquid is dehydrated to remove excess water from the ethanol, making "anhydrous" ethanol suitable for blending with gasoline. recover more value-added products from the grain besides ethanol, CO2, and distillers grains. These innovations and continuing process research are creating better economic opportunities in grain ethanol production, and are changing the ways of looking at an ethanol plant as a community investment. Ethanol can also be produced by a wet milling process that separates the corn into several different components and affords many options for end products, including ethanol. Wet mills are much more complex, and have a much higher capital cost than dry grind plants. Despite the established base of ethanol plants using starch-containing grains as the feedstocks, other interesting ways of making fuel alcohols by fermentation exist. Cellulose, the most abundant bio-based material on earth, consists of sugar molecules that can be broken apart and fermented by certain organisms and/or enzymes. Currently, researchers are studying ways to make ethanol from cellulose that is extracted from biomass, such as corn cobs, corn stover (stalks and leaves), straw from wheat or rice, perennial grasses, such as Miscanthus and switchgrass, and wood waste from the forestry and paper industries. Truck and rail transportation are the major modes of moving ethanol to the blending terminals, where ethanol is mixed with gasoline to form the E-10 or E-85 blends for consumer engine use. Currently ethanol is not transported by pipelines that are designed and used for petroleum-based products, however a few companies are testing shipping ethanol this way. Using the more expensive truck, rail and barge transportation increases the costs to the markets most distant from the ethanol plants. Ethanol is a good fuel for use in spark-ignition engines. It has a high octane number, making it attractive as an antiknock additive in gasoline. It can be used as an additive for diesel (biodiesel). Ethanol is also an important feedstock for the chemical industry. Ethanol production results in a net energy gain— according to some authoritative life-cycle analyses— producing about 67 percent more energy than it takes to grow and process the corn into ethanol.1 The "energy balance often quoted can be misleading, since the ethanol industry is changing rapidly to capture further efficiencies and produce more value-added products from the grain feedstocks.2 One of the ways to increase this efficiency is to create cellulosic ethanol from the co-product DDGS, which is already at the ethanol plant and use the corn cobs and corn stover (leaves and stems) as fuel instead of natural gas. 1. Improvements in Life Cycle Energy Efficiency and Greenhouse Gas Emissions of Corn-Ethanol, Adam J. Liska, Haishun S. Yang, Virgil R. Bremer, Terry J. Klopfenstein, Daniel T. Walters, Galen E. Erickson, and Kenneth G. Cassman. Journal of Industrial Ecology.